M4p to mp3 converter is the best all-in-one itunes m4p converter and drm removal software designed for remove drm protection from apple music, itunes m4p songs, itunes m4b audiobooks and audible aa/aax audiobooks with zero quality loss. It support convert itunes drm protected music (m4p, aac, m4a), audiobooks (m4b, audible aax, aa) and video (m4v, mp4, etc) to common audio files such as mp3, m4a, aac, ac3, m4r, flac, mka, au and more. Convert apple music to mp3, m4p to mp3, m4v to mp3, m4b to mp3 with up to 50x fast speed, with id tags preserved on macos. It aims to help you make apple music, itunes songs, m4v videos, tv shows, podcasts and audiobooks purchased through itunes online stores free for different uses. Any audio or video files that can be played on your itunes will be converted at ultra-fast speed. And there is no difference if your media files are drm protected or not. Batch itunes conversion allows the user to unlock and convert entire itunes library with a couple of clicks. M4p to mp3 converter for mac is especially useful in case if you have protected music that you want to listen on playback device, which doesn t support particular drm technology, like android, tablets, windows phone, samsung, car player or other portable media player. It is the perfect solution for you to enjoy apple music on multiple devices at once without using a family plan. You can even play the music without internet connection after downloading them to your devices. Fully compatible with the latest macos 10.14 mojave and itunes 12.9.3.3. Available in 7 languages: english, japanese, deutsch, french, spanish, simplified chinese and traditional chinese. 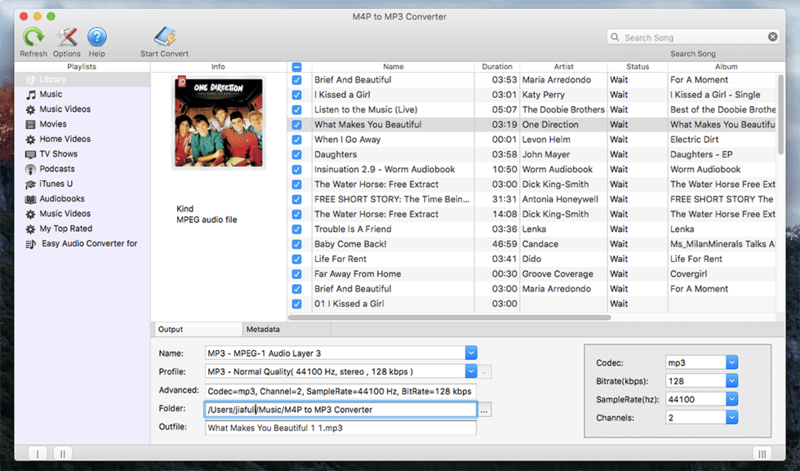 M4P to MP3 Converter for Mac is an audio utility that works under . Estimated download time for M4P to MP3 Converter for Mac on a common adsl connection is less than a minute. Version 5.7.0 was released fifty five days ago by M4P-To-MP3-Converter.com. Click the green download button to download it now.